With a wide range of healthy eating tips, information and ideas, this Nutrition and Health course is packed with practical advice on healthy eating. It explains what healthy eating is and why it’s important. The content covers the dietary needs for different ages, healthy food preparation, food labelling, food additives and eating disorders. 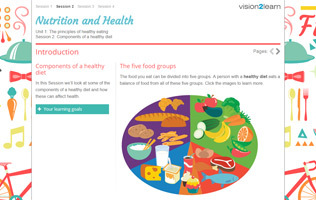 Learners can use the content to write their own healthy eating plans, menus and recipes to ensure that they eat a healthy balanced diet.